In a stunner, St. John’s announced on Wednesday night that standout sophomore guard Marcus LoVett will miss the remainder of the 2017-18 campaign. LoVett suffered a left knee injury that he suffered in late November, and has missed the last ten games of the season, which has included an 0-5 start in Big East Conference play. Team physicians made the decision to sideline LoVett on Wednesday to focus on his rehabilitation, as he was not able to progress to on-court basketball activities. LoVett started all seven of his appearances this season and averaged 14.9 points per game. The Preseason Second Team All-Big East selection dished out 12 assists and recorded 15 steals playing 32.7 minutes per contest. St. John’s head coach Chris Mullin said in a statement, “Marcus has a bright future ahead, so while it is disappointing that he will miss the remainder of the season, his long term health is the primary focus." Wonder if he even made it to the floor before the decision came down from the doctors. 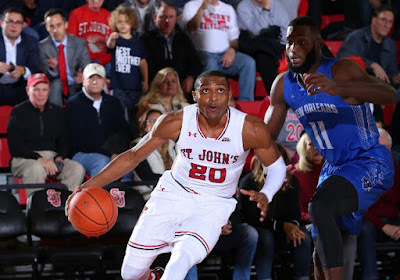 This is a crushing blow for St. John's because they planned on having LoVett, his fellow sophomore standout Shamorie Ponds, and recent transfers Justin Simon and Marvin Clark II to anchor the team and have them build on progress from last season. As a freshman last season, LoVett averaged 15.9 points, 3.8 assists, and 2.9 rebounds per game. The Red Storm were picked to finish sixth in the Big East in a preseason poll and some saw they could possibly crack the top three, but now they will be lucky to live up to that, let alone exceed those expectations. The Red Storm's next game is Saturday night against the number-one team in the country, Villanova, at The Garden.